Who said women stayed at home while men went to sea? Join us in Fowey to hear expert historians talk about the women that shaped our seas and coasts and come on a free tour of historic Fowey and its harbour. 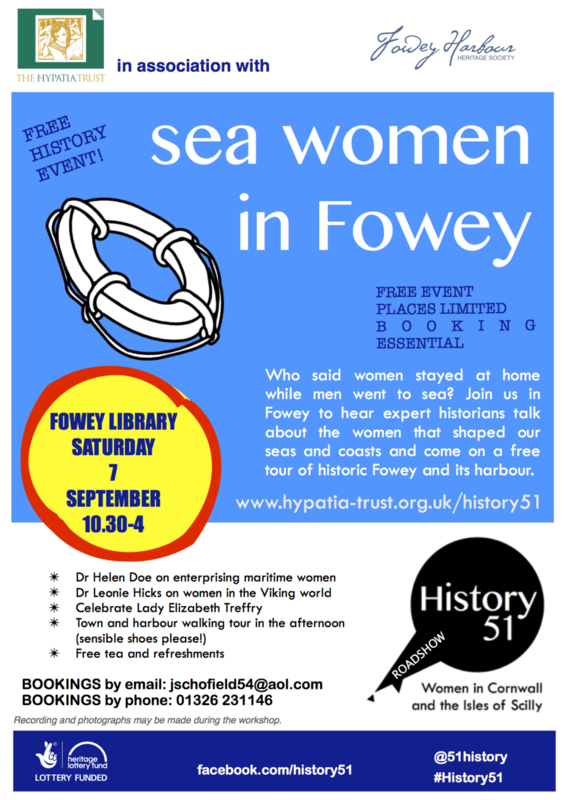 The next History 51 Roadshow FREE event will be in Fowey on Saturday, 7 September 2013. Book now! Email or call Jo Schofield: Email: jschofield54@aol.com Phone: 01326 231146. A free community history event organised by the Hypatia Trust in association with Fowey Harbour Heritage Society. Places are limited and booking is essential. Lunch from 12.30: DIY or bring your own. In the afternoon from 2pm, for about 1.5hrs. Places are limited so please book your place with Jo Schofield by email or telephone. You will be asked whether you want to book for the morning and afternoon tour or just the morning. NOTE: You will not be able to book only for the afternoon tour. There are 20 spaces next to Fowey library. Other town carparks. The Fowey Town Bus operates from the Main carpark at the top of town. Western Greyhound buses nos. 524 and 525 from St Austell and Par railway stations.